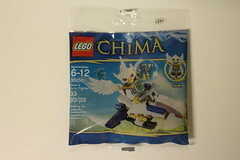 In the second Speedorz review for the Legends of Chima line, YourCreativeFriends has reviewed the CHI Waterfall (70102). The set contains 106 pieces and retails for $14.99, a $0.14/piece ratio. The box contains one small instruction booklet and 5 game cards. Check out the video below for more details of the set. Continuing with our news of the LEGO Legends of Chima theme, we now have a review of Wakz’ Pack Tracker (70004), courtesy of YourCreativeFriends. 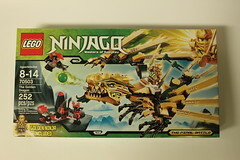 The set contains 297 pieces and retails for $29.99, a very nice $0.10/piece. The minifigures included are Wakz, Winzar and Equila. Check out more details and play features of the set below. 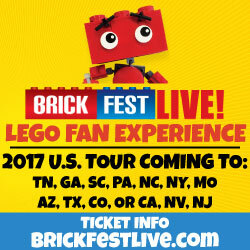 It looks like the LEGO Legends of Chima animated show on Cartoon Network now has a theme song connected with it. The song is called Unleash the Power and is performed by Finley. Like the song from Ninjago, this song is pretty catchy. The Legends of Chima tv show is set to premiere on January 16. What do you think of the song? 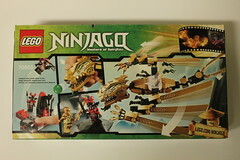 The LEGO Ninjago The Golden Dragon (70503) is mostly taken from a scene in the Ninjago: Masters of Spinjitzu tv series episode Island of Darkness where all the Ninjas go to find the Temple of Light. Here is where they all are transformed into their final outfits including Lloyd Garmadon who becomes the Golden Ninja and summons the Golden Dragon. 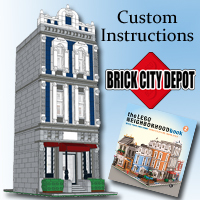 This set contains 252 pieces and retails for $29.99, a $0.12/piece ratio. The box comes with one instruction booklet, three numbered bags, and one un-numbered bag with the dragon head. 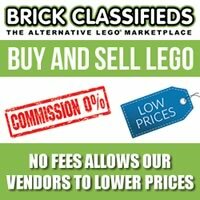 With the recent arrival of the Legends of Chima sets, LEGO isn’t done pushing their newly established original property. They, along with Warner and TT Games, have announced three video games based on the world of Chima and will be releasing them across various platforms in 2013. First is a racing mini-game called LEGO Legends of Chima: Speedorz that is already available on LEGO.com today (although I can’t find it anywhere yet) and on the iOS on January 3rd. Players will be racing characters from Chima through many locations in world of Chima collecting items to power up their vehicles and unlocking more content. The second game coming out is called LEGO Legends of Chima: Laval’s Journey. This looks to be a game coming out for various handheld systems including the Nintendo 3DS, PS Vista, and the Nintendo DS. The main character will most likely be Laval and his allies will be having an adventure in the world of Chima. The Nintendo 3DS and PS Vita versions will be released in Summer 2013 while the Nintendo DS will be available in Fall 2013. The final game being released this year revolving around the world of Chima is LEGO Legends of Chima Online. 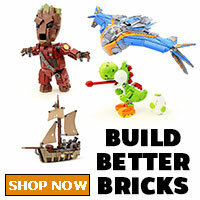 This is a free-to-play online game that allows players to create and customize their kingdom in Chima. Players can also explore the world as well as taking on missions for rewards. 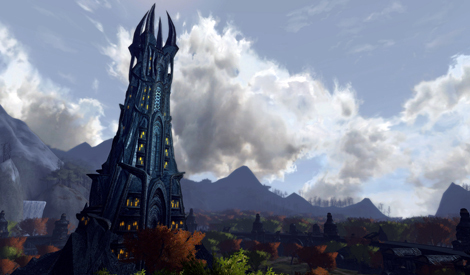 We’re not sure if this is a just single player game or a MMO style game. LEGO wants you to play all three games because there is a reward system called the The Chima Vault where you earn points to unlock more content in LEGO Legends of Chima Online by playing both LEGO Legends of Chima: Speedorz and LEGO Legends of Chima: Laval’s Journey. 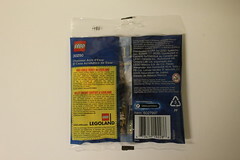 To kick start the new year, the LEGO Legends of Chima has began selling today at LEGO stores and [email protected] As a bonus, LEGO will be giving away Ewar’s Acro Fighter (30250) polybag in the month of January for all purchases over $75. This set contains 33 pieces.